For something as seemingly simple as glass in a frame, windows are incredibly diverse. From transoms located above a window or door, gable windows under a roof or single hung windows in former British colonies, you could fill a book with the construction types, opening types, designs and purposes. But let's not go quite that far. Instead, read more below about the most common designs today including their uses and benefits. There are easily dozens of different window types from casement to arched to transom. However, to better clarify the differences, it is useful to divide them into three groups: windows named for their location, those based on opening style and names based on design. Nevertheless, these three can and do overlap as shown in examples below. Each of these examples can be customized with different sizes and opening styles such as tilt, pivot and casement. However, in these cases the location usually plays a large role in determining the window's performance needs as well as available options in terms of security, insulation, opening mechanism and more. Therefore, they are often discussed as a category to themselves. The next major category is it that of opening style. It is defined by the way the sash and handle function. While basic hinged casement windows were standard for much of history, advances in fenestration technology and manufacturing have seen a number of new options come to market. These options can be combined with many other window styles. At times, the location or shape of the window will limit your options, particularly with less common shapes such as trapezoids, triangles or round windows. However, modern window hardware can offer up to four different operating mechanisms at a time, for example: closed, tilt, turn and parallel action. Old-fashioned single and double hung windows however, are limited by their outdated technology and design. Awning Window Top-hung. Swings out and up forming an awning. Casement Window The casement is side-hung on hinges and swings like a door. Jalousie Windows Parallel slats of glass that open and close like a Venetian blind. Sliding The sash slides horizontally. It does not swing. 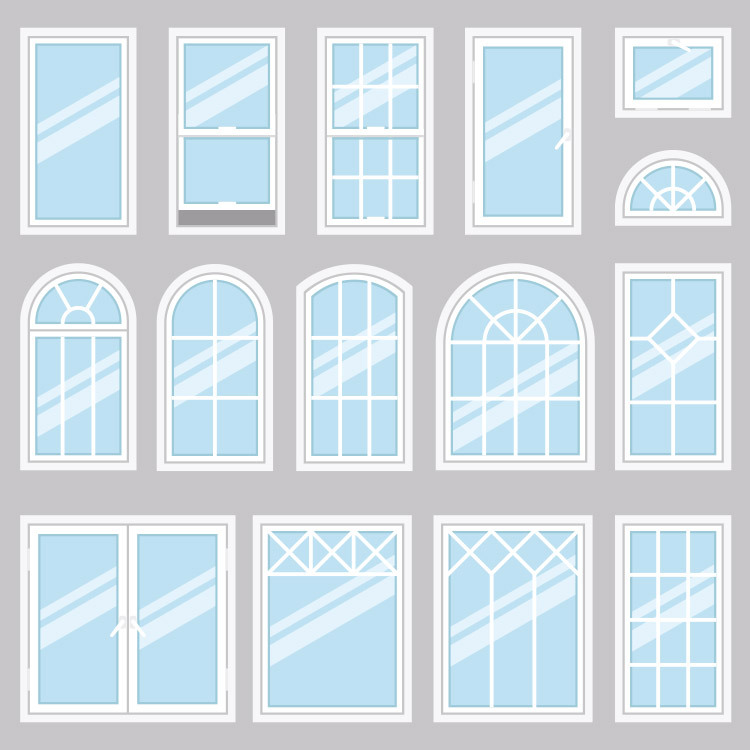 The final main category of window types is based on the design and purpose, not opening function or location. For example, bay windows can come in different configurations, sizes, colours.It may have all fixed casements, all operable ones or a combination thereof. But we differentiate from others based on the overall design: a window that projects outwards from the main wall forming a small bay. Neuffer offers window frames in a variety of different material including wood and vinyl, or aluminum clad versions of each. Aluminum only is also available upon request. Even the most affordable materials can easily be upgraded with additional hardware and insulating features if required which can bring them to the same level as timber. Wood boasts great natural insulation and strength without additional reinforcement, foam or internal chambers required. It provides an elegant and natural look for any home while requiring a little more upkeep than synthetic materials Aluminum cladding represents the best of both worlds. For those on a stricter budget, aluclad vinyl provides solid security, insulation and aesthetics at a great price. For the ultimate bespoke solution and unparalleled aesthetics, aluclad wood frames are second to none. They feature a sleek modern exterior look with the cozy look of wood indoors. As with all windows, there are a wide range of further options that can be fitted to reach the thermal insulation, sound reduction and security needs of your project.